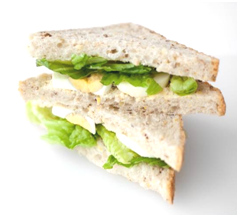 Include at least one, but preferably three, vegetable or salad fillings, such as lettuce, spinach, tomato, cucumber, capsicum, carrot, beetroot, mushroom, pineapple, red onion or alfalfa. Grilled vegetables add flavour and texture, but use only minimal amounts of vegetable oil (a brush or a spray) when cooking. Try zucchini, eggplant, pumpkin, mushrooms or red capsicum. Select wholemeal and multigrain bread, instead of white. Replace butter with small amounts of poly- or mono-unsaturated margarine. Even better, replace margarine with avocado, mustard or reduced fat ricotta, cream cheese or cottage cheese. 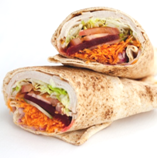 Offer a variety of sandwiches, wraps and rolls on a platter. 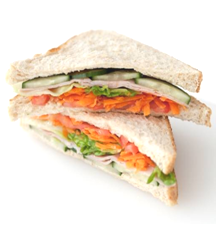 Provide approximately one and a half sandwiches, two half wraps or one roll per person if catering for lunch. Provide a variety of fillings with a focus on vegetables. Include vegetarian and non-vegetarian options. Take care with appearance, and try using fresh herbs to garnish the platter. This is to be used as a guide only. Any variations to the combinations listed (including spreads and condiments) may change the classification. For an accurate classification of food and drinks, contact us. Try the following GREEN and AMBER combinations on your next catering platter. Note: Avoid providing large serving sizes of schnitzels. Often half a fillet is adequate for one sandwich. Note: Using reduced sodium ham (<750mg per 100g) would make these GREEN.